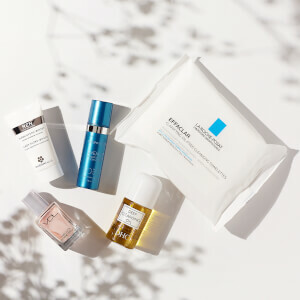 Say hello to younger-looking skin with the Elemis Editors Pick (3 Products) set. Containing three of Elemis' most powerful anti-aging products that are packed with protective antioxidants, this handy set is perfect for mature complexions. - L.M. Elemis Papaya Enzyme Peel 50ml: With 7 active ingredients to repair and protect your skin, the natural exfoliating fruit enzyme action of papaya and pineapple will smooth, brighten and clarify your complexion, whilst seaweed actives and vitamin E smooth, moisturize and remineralize your skin. Dead skin cells will be gently sloughed away, revealing a brighter and more youthful-looking complexion. Particularly suited to mature and delicate skin, it also offers antioxidant and free radical protection. Elemis Cellular Recovery Capsules 60 Caps: Containing potent age-defying antioxidants, these capsules dramatically improve the appearance of lines, wrinkles and discoloration. Formulated with extracts of moringa oil, lavender and rose to help protect and repair your skin, they also rid the skin of toxins so that nutrients can be more readily absorbed, helping to leave your skin soft and supple. Elemis Pro Collagen Marine Cream 50ml: This powerful anti-aging cream provides a progressive lifting effect through increased collagen support, helping to target fine lines, wrinkles and sallow skin. Delivering visible results in just 15 days, this rich and luxurious cream uses padina pavonica, a marine extract, to deliver intense hydration. Your skin will be left with a younger, smoother appearance.